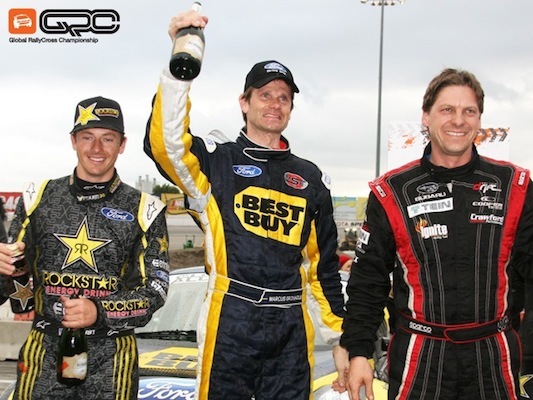 The Sebs, Rising Generations, and the “Global” Rallycross Championship | What in the World Rally? I honestly thought it had only been a few months since my last post, but alas! It never ceases to amaze me how time marches on, how the seasons pass, and how every day there’s yet another meal to cook (but I let my husband blog about that). The seasons are changing in the world of motorsport as well. Michael Schumacher’s dominance as we knew it has ended. Just when we thought Lewis Hamilton would succeed him, he was outshined by another German, Sebastian Vettel, who looks poised to reign supreme. Will the same happen in rally? Has a worthy pretender to Sebastien Loeb’s throne been found not in Mikko Hirvonen or Jari-Matti Latvala, but in Sebastien Ogier? Has Ogier actually been cloned in a French lab by rally-loving geneticists who, in their rush to inject talent into the sport, accidentally gave him the same name as his forebear? Are these people behind Sebestian Vettel as well? If you name your child Sebastien, will he poop his diapers faster than the other babies? My point is, as much as I hate change, the march of time eventually robs our heroes of their prime, and the next generation must arise. Sure, we’re still far from rally’s heyday back in the 80’s and 90’s. But as much as I hate to see Sebastien Loeb lose, we are witnessing the ascendancy of the next World Rally Champion. And we have the fortuitous opportunity to compare the old and the new, apples to apples. We’ll know, that future day when Ogier is winning rally after rally, that he is as good, or perhaps even better than, the former greats. We’ll know that rally still has masterful talent behind the wheel. We don’t have to worry that rally is losing its glory. Loeb’s former rival, the ever-entertaining Marcus Gronholm, put himself out to pasture in 2007, at the height of his game. I understand he got a bit bored in that pasture, but in a rather remarkable turn of events, he found a way to cure his boredom and come to California! Marcus has been dabbling in rallycross for a while, but he is now driving a Ford Fiesta in the “Global” Rally Championship. This is its first year, created in response to the interest generated by the X Games’ rallycross event, and it takes place in the western US. There were only three rounds this year, of which Marcus contested two, but even if there were 15, he’d smoke the other guys every time! And I’d imagine he’ll do the same at the X Games in July. There’s just no competition…but it’s always a pleasure to see good driving for the sake of good driving. So if you’re in LA in July, make sure to snag some tickets to the two rally events this year! Rally cars in the streets of Downtown LA? Sweet. PS: If there are any rally-loving American geneticists reading this–would you mind going to the X Games and cloning Marcus Gronholm? America needs a WRC champion! PSS: If/When the NBA lockout happens next year–I know what to do with the empty Staples Center! June 27, 2011. Auto Racing, F1, Motorsport, Rally, Rallying, Thoughts, WRC.